Climbing Toubkal was a challenge I had been contemplating for some time. It was recommended to me by good friend and fellow mountain junky who said that I really should climb it in the winter. So, when I spotted a great deal travelling with the Adventure Company for the winter climb I hastily booked my spot and packed my bags. I was off to Morocco! After arriving in Marrakech and settling down for the night in the hotel, I woke early and made my way to the rendezvous point to meet the rest of the group and sort out the local payment. It turned out that there were seven of us in my group and that we had two guides. Shortly after, with bags packed and us feeling ready for the climb, we headed off for a quick guided tour around Marrakech and then off to the mountains in the mini bus. After a lunch-stop for chicken and chips by a picturesque river we arrived at our first stop in the village Imlil (1,790 metres). From here we walked for 1 hour to the village of Aremd and our first refuge. It was a simple place with reasonable amenities and great views up the valley towards Toubkal – although there was cloud around higher ground which was a bit of a talking point. The food that night was really good, although this is where we had our first taste of one of the many sweet teas that are enjoyed by the locals in Morocco. The group all chatted and got to know each other better over dinner, and of course we had a million questions for the guides. However, it wasn’t long before we were all yawning and wanting to sleep so we bedded down for the first of many early nights – just as well because there were a lot of early starts too! We had an early start the next morning, kicked off by a hearty breakfast. After a quick bag packing session and loading the mules, we were soon saying bye to the owner of the refuge and heading up the valley through walnut trees. As we walked along the valley, the wooded scenery suddenly changed into dry, dusty and baron looking terrain. The rocks were a strange mixture of colours; purple, orange, green and brown, which looked really strange. There were few plants around, but we were assured that in the summer there were lots of plants and flowers around, but the baron landscape was amazing in its own right. The skies were crystal clear all the way up the valley, and this gave us all a lot of hope for a clear summit day. We had a couple of brief stops, including one at the Sidi Chamarouch where there is a grave of an Islamic witch doctor and is covered by a huge white stone. We were told that the grave is a very popular pilgrimage for Moroccans, and only Muslims can cross the little bridge to visit it. So we sat by a local shack and drank sweet tea and ate sugar coated nuts, which is another thing they like in the Atlas mountains. After taking plenty of pictures and another rest stop we walked the last couple of hours up to the Toubkal refuge (3,207 metres) where we came across our first snow and ice. This was our chance to try out crampons and winter gear to check everything was in working order and to make certain that we were ready to attempt the summit. The refuge is great and has hot running water, comfortable rooms and plenty of extras, including a log fire and a small shop stocking chocolate and drinks. 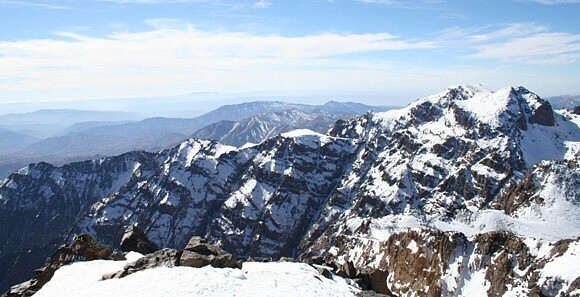 Normally the next day would be spent preparing for the summit by climbing another mountain near Toubkal, but because of the crystal clear skies, the guides and all of the group wanted to go for the summit the very next day. It seemed like the best plan to me too, so after a really nice meal and a game of chase the ace we headed back to our dorms. Packed and ready for the summit day, we got an early night and briefly talked about irrelevant things as you do in a dorm, before falling to sleep. Early the next day we all got up for breakfast, a little excited and a little nervous of what the day would have in store for us. With crampons on, ice axe in hand and layer upon layer of warm clothing on, we were ready for Toubkal. We left the refuge in the dark and straight away found ourselves scrambling up a rocky section next to a frozen waterfall. It looked very impressive – and very cold! This led us to a section that we had been gazing at from the refuge. A steep section with a mix of deep snow and ice. This is where pre-training comes into the equation. It might not sound too bad, but it was a heavy steep plod at around 3,600 metres, air was thinning and people were starting to feel the altitude. The skies were getting lighter by this time and it was looked like we were going to have another crystal clear day. This really started to raise the atmosphere in the group and things became easier somehow! Eventually, after what seemed like an endless zig-zagging plod, we reached the ridge from where we got our first feel of the sunshine on our faces, and our first view of the snow-covered summit and surrounding Atlas mountains. We had a really great view but we knew the views would be better on the summit. After a snack break and a chance to take on some more water, we headed up the ridge towards the summit around some fairly steep and tricky sections. Then suddenly we could see the outline of a huge triangle. It was the summit. As we all walked along the final hundred or so metres, the views got better and better, the triangle got bigger and the excitement got greater. 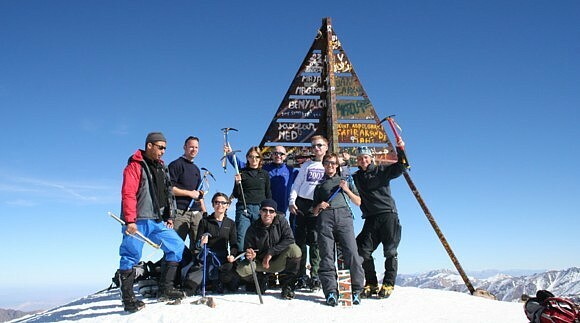 And then there we were, on top of north Africa – Toubkal summit at 4,167 metres high. After plenty of congratulating and shaking of hands it suddenly struck us that we were standing on the top of the Atlas mountains looking down on Marrakech, the desert, the rest of the Atlas mountains and Morocco, and it felt amazing. I think the reason we go on these trips is because of that very feeling which you can’t really explain until you have been there, but once felt never forgotten. You almost feel like you are standing on top of the world looking down on everyone and nothing else matters. We took pictures from every angle and direction until we had run out of ideas and decided after eating more sugar coated nuts we would head back to the refuge. It was a real shame to leave the summit but we were all tired and had made the most of the experience. We took a much more direct route back down to the refuge, and it was really steep and icy at first. The second guide had to make an ice axe arrest on a really steep section, narrowly escaping a huge drop. That was a reminder of how dangerous mountains can be and why we had the ice axes with us. Not surprisingly we were all a little more careful after that, until we reached a huge snow field that was! We dropped to the floor and glissaded down using the axes to control our speed and direction. It’s amazing how quickly we managed to get back down to the rocky section near the refuge, and after we conquered that section we arrived back at the refuge elated, knackered and strangely in need of sweet tea. That night we celebrated with more sweet tea over dinner and talked all night. We had climbed Toubkal and I have to say it was one of the best mountains I have ever climbed and the extra smaller climbs that followed over the next couple of days completed a great trip. After returning back down the valley we celebrated in Marrakech with a nice meal and a few bottles of wine. I think we will be seeing more of Morocco. Overall the trip was amazing, the guides and local people very friendly, Marrakech is a cool city and the people are relaxed about their views of westerners. The views are stunning! You will love it here, we did!